Microsoft has officially announced and launched the public availability of Windows 7 SP1 Beta and Windows Server 2008 R2 SP1 Beta during the Worldwide Partner Conference 2010. The Service Pack 1 of Windows 7 and Windows Server 2008 R2 shares the same setup installer, and can only be applied on system running the final RTM version of the operating systems. Although the SP1 of Windows 7 and Windows Server 2008 is now publicly available, note that Microsoft does not offer this early release of Windows 7 and Windows Server 2008 R2 SP1 Beta for home users, and installation is not supported by Microsoft. However, everybody who wants to download and install the beta version of SP1 can register at TechNet and be granted the downloads. The official version of Windows Server 2008 R2 SP1 Beta and Windows 7 SP1 Beta is a of the same version with the leaked Windows Server 2008 R2 and Windows 7 SP1 Beta Build 7601.16562. Registrants have two options to download the SP1, either through Windows Update or download the ISO which contains both 32-bit and 64-bit versions for Windows 7 and Windows Server 2008 R2. Register and download the Windows 7 SP1 Beta and Windows Server 2008 R2 SP1 Beta at TechNet Evaluation Center. To register, user needs to fill in a questionnaire which is more related to IT professionals. Users who want to skip the registration process to download the SP1 Beta directly can use the following direct download links to download the official SP1 Beta from Microsoft Server. The ISO contains windows6.1-KB976932-x86-INTL.exe (32-bit), windows6.1-KB976932-X64-INTL (64-bit), and windows6.1-KB976932-ia64-INTL.exe (IA-64), and works on both Windows 7 and Windows Server 2008 R2. 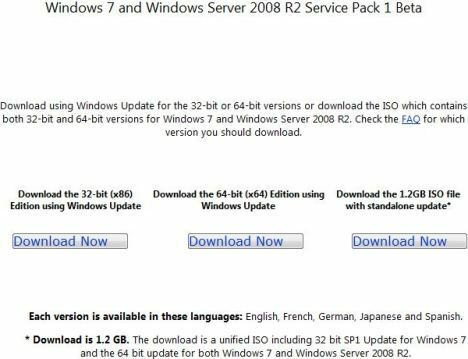 Note that Windows 7 and Windows Server 2008 R2 SP1 Beta is only available for English, French, German, Japanese, and Spanish only. After installing the beta, the system will expire on June 30, 2011, where by then users have to upgrade to a newer or final build, or uninstall the SP1 beta. Windows 7 and Windows Server 2008 R2 SP1 contains updates to bring the PCs and servers to the latest support level, provides ongoing improvements to the Windows Operating System (OS), by including previous updates delivered over Windows Update as well as continuing incremental updates to the Windows 7 and Windows Server 2008 R2 platforms based on customer and partner feedback, and is easy for organizations to deploy a single set of updates. For detailed changes and additional improvements on the SP1, check out Notable Changes in Windows 7 SP1 and Windows Server 2008 R2 SP1 document, the SP1 Beta FAQ and documentations for SP1 Beta. And, there is guide to uninstall Windows 7 or Windows Server 2008 R2 SP1 Beta for people who want to remove and get rid of the SP1.